Another quiet week as Blu-ray and DVD revenue both fell compared to last week, with Blu-ray falling a bit more ensuring Blu-ray market share also fell. 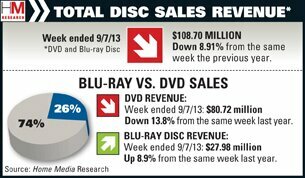 In fact, both Blu-ray revenue and market were at their lowest levels for 2013. Last week's number one seller, 42, remained at the top of this week's Blu-ray top 20 chart. You have to go to 4th place to find the first new release on this week's chart, which was the direct-to-video movie Vehicle 19. Only three more new releases were on the combined Blu-ray and DVD top 20, and two of those (Dragons: Riders of Berk - Part 1 and Part 2) were DVD only releases. The other, Home Run, was a Walmart exclusive and came 20th on the combined chart but not unexpectedly failed to make the Blu-ray top 20. The only notable new release of the week, Vehicle 19, didn't really do particularly well on Blu-ray either. Only 23.74% of discs sold for the title contained a Blu-ray version of the film. Which was still better than the performance of Home Run, which only managed 11%. None of the new releases were available on Blu-ray 3D. The stats for the week ending 28th July 2012 are as follows. Some small adjustments to the data posted last year (based on more recent updates) has been made and is shown below. Despite this being a relatively quiet week, in many ways, it was still better than the same week last year, at least where Blu-ray performance is concerned. Blu-ray sales increased by $0.36m (up 1.8%), while DVD sales decreased by $3.67m (down 4.9%) producing an overall loss of $3.31 million in combined revenue. Blu-ray's market share grew, from 20.95% to 22.10%. Both Blu-ray and DVD revenue, and Blu-ray market share, picked up a little compared to the lows of last week as the release of G.I. Joe: Retaliation helped boost sales. It was only one of three new releases in the Blu-ray top 10 though, so the week ending the 3rd of August 2013 was still a relatively quiet one. The second most popular Blu-ray title, also a new release, was Justice League: The Flashpoint Paradox. It trailed the first placed G.I. Joe by a considerable (more than a 6:1) margin. The third of the new releases was an exclusive to Blu-ray. Star Trek: The Next Generation - Season Four warped onto Blu-ray and finished in 7th place. While G.I. Joe: Retaliation easily shot to the top of the Blu-ray sales charts, it was Justice League: The Flashpoint Paradox that powered its way to the top of the BD sales share chart, with 60.47% of all discs sales for this title having included a Blu-ray version of the film. G.I. Joe also managed to break the 50% mark (meaning more Blu-rays were sold than DVDs), with 54.31%. It was also available on Blu-ray 3D, and 7% of all discs sold contained the 3D version. Season 4 of Star Trek: TNG was a Blu-ray exclusive, as mentioned previously. The stats for the week ending 4th August 2012 are as follows. Some small adjustments to the data posted last year (based on more recent updates) has been made and is shown below. Blu-ray sales increased by $11.05m (up 62.5%), while DVD sales decreased by $1.3m (down 1.7%) producing an overall gain of $9.75 million in combined revenue. Blu-ray's market share grew strongly, from 18.79% to 27.66%. Blu-ray spending and market share was up thanks largely to one title: Oblivion. It was easily the best selling disc for the week, and on Blu-ray, it beat the second placed G.I. Joe: Retaliation by almost a 5:1 margin. It was by no means the only new release for the week. Mud did well enough to warrant a third place finish, just ahead of The Place Beyond the Pines. The 5th best selling title was also a new release, at least on Blu-ray. Disney's 1973 version of Robin Hood was available on Blu-ray for the first time as part of 40th anniversary edition, although it wasn't a Blu-ray exclusive like with many of Disney's catalog releases. Similarly, The Sword in the Stone also saw its release as a 50th anniversary edition, and it finished in 8th place. There were also a collection of DVD-only releases, including Duck Dynasty: Season 3; Wings; and My Little Pony: Equestria Girls. So a good collection of new releases, a relative hit, plus some Disney classics that generally do better on Blu-ray than on DVD, and we have a very respectable week in terms of Blu-ray sales. Unsurprisingly, the two new Disney releases had the best BD sales results, meaning they sold much better on Blu-ray than on DVD. 78.94% of all editions of The Sword in the Stone that were sold in the week contained the Blu-ray version of the film, with Robin Hood just behind with 73.37%. Oblivion may have only done averagely at the box office, but it was a hit on Blu-ray with 59.74% choosing the HD version of the SD version. For a film of its genre, The Place Beyond the Pines's 45.79% is quite impressive as well. Only Mud relatively disappointed, with only 28%. The stats for the week ending 11th August 2012 are as follows. Some small adjustments to the data posted last year (based on more recent updates) has been made and is shown below. Blu-ray sales increased by $2.04m (up 7%), while DVD sales decreased by $11.61m (down 13.4%) producing an overall loss of $9.57 million in combined revenue. Blu-ray's market share grew, from 25.13% to 29.32%. A quieter week than last week, as only one of the new releases did better than average on Blu-ray (which meant that Blu-ray revenue fell, while DVD revenue remained relatively steady compared to last week). That release, which was also the top selling Blu-ray for the week, was Olympus Has Fallen. It easily outsold last week's number one, Oblivion, and also managed to sell a lot more copies than The Big Wedding in fourth spot, another one of this week's new releases. Also new for the week, and in the top 10, was Once Upon a Time: The Complete Second Season in 10th spot. Emperor was another new release, but it did not sell enough copies on Blu-ray to get into the top 10 - finishing in 14th place. So another quiet week, but that will soon come to an end with the release of Iron Man 3, Star Trek Into Darkness, The Great Gatsby and World War Z all on the horizon. As mentioned earlier, of the new releases, Olympus Has Fallen had the best BD sales share figure - 44.92% of all disc packages sold for this film contained the Blu-ray version. The rest recorded fairly average results. The season season of Once Upon A Time managed 25.85%, which is a relatively good result for a TV season Blu-ray set. Emperor's 24% and The Big Wedding's 16% are well below average though. The stats for the week ending 18th August 2012 are as follows. Some small adjustments to the data posted last year (based on more recent updates) has been made and is shown below. All all red week this week compared to the same week last year, but the comparison isn't exactly fair. This time last year was when The Hunger Games was released; it was one of the milestone releases from last year. Blu-ray sales decreased by $13.57m (down 34.2%), while DVD sales decreased by $33.6m (down 30.9%) producing a huge overall loss of $47.17 million in combined revenue. In a rare event, Blu-ray's market share dropped from 26.73% to 25.78%. The release of Epic did little to raise, or drop, Blu-ray and DVD revenue for the week ending 24th August 2013. Business was largely unchanged compared to the previous week. This is despite Epic easily outselling last week's number one, Olympus Has Fallen. Despite doing almost nothing at the box office, Killing Season did well enough on Blu-ray and in particularly DVD to debut as high as 3rd on the combined (Blu-ray and DVD) chart, and 5th on the Blu-ray only chart. On the Blu-ray top 10, Killing Season only just managed to beat Scary Movie V in 6th place. It's that time of the year when TV show Blu-rays start to make an appearance. The most notable release this week was Boardwalk Empire: The Complete Third Season, coming in at 7th on the Blu-ray chart. On the combined chart, there were three other new releases. Scooby-Doo! Stage Fright was 15th on the combined chart, but not in the Blu-ray top 20. NCIS: The Tenth Season was in 7th and Heart of the Country in 17th. Both of these two were DVD only releases though. Epic's 40.28% BD sales share wasn't exactly epic, but was respectable enough. 39% of Boardwalk Empire: S3 boxsets were Blu-ray ones, which is very good for a TV series boxset. Scary Movie V and Killing Season rounded out the BD sales share top 20 chart with 25.66% and 25.03% respectively. Epic was also available as a Blu-ray 3D release, and 9% of all sets sold contained the 3D version. The stats for the week ending 25th August 2012 are as follows. Some small adjustments to the data posted last year (based on more recent updates) has been made and is shown below. All all red week this week compared to the same week last year, as The Hunger Games back then was still dominating sales (and that week 7 new releases out of the top 10, including 2 Blu-ray exclusives). Blu-ray sales decreased by $12.42m (down 32.7%), while DVD sales decreased by $29.9m (down 28.1%) producing another huge overall loss of $42.32 million in combined revenue. Blu-ray's market share again dropped from 26.31% to 25.05%. The release of the A-list The Great Gatsby helped Blu-ray revenue and market share to both rise compared to recent weeks. The Great Gatsby was clearly the week's best selling title, on Blu-ray and DVD. The title that came closest was another new release, Pain & Gain, in second place. In 4th place was The Walking Dead: The Complete Third Season. In a distant 5th place was another TV season boxset, Sons of Anarchy: Season Five. 6th place belonged to Super Buddies. New to Blu-ray was Disney's The Many Adventures of Winnie the Pooh, which finished in 10th place. Making the top 10 combined (Blu-ray and DVD) chart, but not making the top 10 Blu-ray chart, were two more new releases. Barbie Mariposa & the Fairy Princess finished in 7th on the combined list, but only 12th on the Blu-ray chart. In 14th placed on the combined chart was Stranded, which finished 17th on the Blu-ray chart. So a smattering of new releases, topped by The Great Gatsby. Enough to list Blu-ray sales out of a mini slump, but not enough to get it to reach new heights. I suspect we won't have to wait too long for that though. Of the new releases this week, The Many Adventures of Winnie the Pooh had the best BD sales share result - 65.47% of all disc packages sold contained the Blu-ray version of the film. The Great Gatsby did okay on Blu-ray, with 39.88%, just above The Walking Dead: S3's 39.81%. Pain & Gain managed 36.79%; Stranded managed 23.27%; and with Sons of Anarchy: Season Five, Super Buddies, and Barbie Mariposa & the Fairy Princess managing 21%, 20% and 10% respectively. Of the new releases, only The Great Gatsby was available on Blu-ray 3D. But it only managed a 4% BD3D sales share, meaning only 1 in 10 Blu-ray packages sold contained the 3D version. The stats for the week ending 1st September 2012 are as follows. Some small adjustments to the data posted last year (based on more recent updates) has been made and is shown below. Despite the release of The Great Gatsby, it was almost another "all red" week. Thankfully, this week's slightly higher Blu-ray market share prevented that. The same week last year also saw the release of the last season of the same two TV boxsets. The Walking Dead actually did better on Blu-ray last year with S2 than with S3 this year, 50.27% BD sales share for S2 compared to 39.81% for S3. The same was true of SoA, 26% for S2 compared to 21% for S3. Both results are somewhat unexpected. Blu-ray sales decreased by $7.22m (down 19.3%), while DVD sales decreased by $23.23m (down 21.6%) producing an overall loss of $30.45 million in combined revenue. Blu-ray's market share grew from 25.82% to 26.83%. Now You See Me dominated the sales charts for the week ending 7th September 2013. It outsold last week's number one, The Great Gatsby, by almost a 4-to-1 margin, but there was not enough magic to prevent Blu-ray revenue and market share from declining, compared to the previous week. This was despite three other new releases in the top 10, the best performing of which was The Lords of Salem in 5th place. Spartacus: War of the Damned and Empire State occupied the 6th and 7th spots respectively. A couple of other new releases failed to make the Blu-ray top 10. The Iceman came closest, finishing at 11th. It was followed by From Up on Poppy Hill in 12th and The Vampire Diaries: The Complete Fourth Season in 15th. Finishing outside of the top 20 entirely was the critically acclaimed smash hit Sharknado. So despite the healthy number of new releases, none of the titles, not even Now You See Me and not even Sharknado were able to keep Blu-ray revenue and market share at last week's highs. Surprisingly, it was one of the titles that failed to make the top 10 that had the best BD sales ratio. And even more surprisingly, it was not Sharknado. From Up on Poppy Hill managed to have a BD sales share of 52.96%, meaning the Blu-ray version was more popular than the DVD version of the title. Now You See Me's 41.58% was respectable, although it could have been higher. Spartacus: War of the Damned was closely behind with 41.50%. The Lords of Salem managed 37.93%, while The Iceman had 28.84%. The rest of the new releases failed to make the BD sales share top 20. Empire State had 22%; The Vampire Diaries: The Complete Fourth Season had 21%. And 95% of people who were interested in Sharknado though that the inferior DVD version was the better option. No Blu-ray 3D releases. Not even Sharknado (but there is apparently a Blu-ray 3D version of this instant classic, available in Germany - a missed opportunity for the US market, me thinks). The stats for the week ending 8th September 2012 are as follows. Some small adjustments to the data posted last year (based on more recent updates) has been made and is shown below. Blu-ray sales increased by $2.29m (up 8.9%), while DVD sales decreased by $12.92m (down 13.8%) producing an overall loss of $10.63 million in combined revenue. Blu-ray's market share grew from 21.53% to 25.74%. All it takes is one good release, and Blu-ray's weekly market share jumped by more than 10%, with revenue also jumping to a recent high. While the sales results don't go to where it hasn't boldly gone before, the week ending 14th September may mark the true beginning of the pre-holiday and holiday sales period, traditionally a busy time for Blu-ray. As you may have guessed, Star Trek Into Darkness was the week's top seller, outselling last week's number one, Now You See Me, by almost a 20-to-1 margin. The rest of the new releases in the top 10 were all TV season box set releases. The Big Bang Theory: The Complete Sixth Season managed to sell the most out of these box sets on Blu-ray, coming in at 3rd place. Homeland: The Complete Second Season was next in 6th. Supernatural: The Complete Eighth Season finished just outside of the top 10, in 11th; Peeples was just behind in 12th. Hammer of the Gods finished 18th on the combined Blu-ray and DVD charts, but failed to finish in the Blu-ray top 20. The Smurfs: The Legend of Smurfy Hollow and Castle: The Complete Fifth Season were DVD only releases. But the week was all about Star Trek Into Darkness (which also helped the first rebooted Star Trek to get back into the top 10, at 10th), making this the best week for revenue and market share since the release of The Hobbit in March. Star Trek Into Darkness not only topped the sales charts, it also topped the BD sales share chart, with an amazing 71.80% of all discs sold containing the Blu-ray edition of the film. The next best performer was Star Trek, at 56.42%. You have to go down to 17th place to find the next new release on the BD sales share chart: The Big Bang Theory: The Complete Sixth Season managed 26.31%. Homeland: The Complete Second Season was just behind with 25.98%. As for the rest: Hammer of the Gods got 20%, Supernatural: The Complete Eighth Season	had 17% and Peeples managed 13%. Of the new releases, only Star Trek Into Darkness was available on Blu-ray 3D. 13.56% of all discs sold contained the 3D version of the film, meaning that a 3D version was sold for every 2 copies of the DVD-only edition. Don't know if that's impressive for the 3D version, or a fail for the DVD edition. The stats for the week ending 15th September 2012 are as follows. Some small adjustments to the data posted last year (based on more recent updates) has been made and is shown below. Blu-ray sales increased by $13.39m (up 39.1%), while DVD sales decreased by $16.01m (down 15.8%) producing an overall loss of $2.62 million in combined revenue. Blu-ray's market share grew from 25.26% to 35.83%. Despite the release of another A-lister, Blu-ray revenue and market share both dropped compared to the highs of last week. The A-lister in question was World War Z, which easily topped the sales charts for the week ending 21st September 2013. Apart from this release though, it was a relatively quiet week. The only notable entry into the top 10 was the Walmart Blu-ray exclusive Star Trek/Star Trek Into Darkness double-pack, which did well enough to get to 3rd place on the Blu-ray sales chart. The only other new release in the top 10 was Arrow: The Complete First Season, in 9th place. A few new releases failed to make the top 10. The Bling Ring finished 12th, Grimm: Season Two was 14th. Thomas & Friends: King of the Railway - The Movie failed to make the top 20, despite coming in 14th on the combined Blu-ray and DVD charts. But despite the drop in Blu-ray market share and revenue, compared to last week, Blu-ray market share still remained above 30%, and revenue was still high at $35m. And it's only going to get better next week, when Iron Man 3 debuts. World War Z did very well on Blu-ray, although not as well as Star Trek Into Darkness's performance last week. 58.05% of all discs packages sold for World War Z contained the Blu-ray version of the film. A great result for a TV show boxset was the first season of Arrow, which managed a BD sales share of 43.20%. In comparison, Grimm: Season Two only managed 24.39%. For the other new releases, The Bling Ring managed 26.88% and Thomas & Friends: King of the Railway - The Movie got 8%. For Blu-ray 3D, World War Z was available on 3D, and 9.71% of all discs sold contained the 3D version of the film. The stats for the week ending 22nd September 2012 are as follows. Some small adjustments to the data posted last year (based on more recent updates) has been made and is shown below. Blu-ray sales increased by $6.93m (up 24.2%), while DVD sales decreased by $11.78m (down 13.1%) producing an overall loss of $4.85 million in combined revenue. Blu-ray's market share grew from 24.16% to 31.28%. The release of the clearly A-list Iron Man 3 has enabled Blu-ray revenue to get above $40m, and for Blu-ray market share to reach the second highest point of this year. Those with long memories will remember the original Iron Man being one of the early hits on Blu-ray, the week in which it was released broke Blu-ray market share records. Of course, that record was only 9.4%, nearly four times less today's Blu-ray market share (which isn't even close to the record, which incidentally was broken this week last year by The Avengers, at 44.10%). While Iron Man 3 definitely dominated the sales charts, there were a couple of other new releases too. Redemption was the 5th best selling Blu-ray for the week, and came closest to Iron Man 3 (which only sold just shy of 50 times more copies). The only other new release in the Blu-ray top 10 was the 35th anniversary release of Halloween, at 9th place. The other new releases that didn't make the top 10 includes I Spit on Your Grave 2 in 11th, Hannibal: Season One in 12th, the Blu-ray only The Dark Knight Trilogy: Ultimate Collector's Edition in 18th and Triple H: Thy Kingdom Come in 19th. There were yet more new releases that didn't make the Blu-ray top 20, including Foyle's War: Set 7 and Modern Family: The Complete Fourth Season. Family Guy Vol. 11 was also new, but it wasn't available on Blu-ray. Despite the quantify of new releases, it was clear that it was the quality that made the difference this week. Out of all the new releases, it was the 35th anniversary re-release of Halloween that had the best BD sales share, with 82.92% of all disc packages sold containing the Blu-ray version of the film. That's not to say that Iron Man 3 didn't do well - at 62.95%, it's clear that consumers are choosing Blu-ray over DVD for most new mega releases these days. The latest season of Modern Family on Blu-ray got 16%, with Foyle's War: Season 7 at 13%. Iron Man 3 was available on Blu-ray 3D, the only new 3D release in the top 20. The Blu-ray 3D version counted up to be 7.42% of all sales for the film. The stats for the week ending 29th September 2012 are as follows. Some small adjustments to the data posted last year (based on more recent updates) has been made and is shown below. Despite the A-list release of Iron Man 3 this week, it was another "all red" week as DVD revenue, Blu-ray revenue and Blu-ray market share all fell compared to the same week a year ago. But as mentioned earlier, this is perfectly understandable, considering the fact that the same week last year was when the record breaking The Avengers was first released. With that in mind, Blu-ray sales decreased by $41.48m (down 47.1%), while DVD sales decreased by $32.6m (down 29.2%) producing an overall loss of $74.08 million in combined revenue. Blu-ray's market share dropped from 44.10% to 37.08%. The release of a couple of blockbusters, and a Blu-ray exclusive helped both Blu-ray and DVD revenue to rise from last week's highs, although DVD revenue rose a bit more than Blu-ray revenue, ensuring that Blu-ray market share actually shrank slightly. The Croods was the best selling new release for the week on combined platforms, but it was actually The Little Mermaid that was the best selling Blu-ray for the week. The fact that Disney chose to release the animated classic as a Blu-ray exclusive (meaning all sell-through packages of the film contained the Blu-ray version of the film, even the editions in DVD packaging, and so all sales counted for Blu-ray). The Croods ended up being second place on the Blu-ray chart. In 4th place on the Blu-ray chart was This Is the End. A Blu-ray double feature pack that includes Pineapple Express, exclusively available to Walmart, also managed to reach the top 10, finishing in 10th place. A prominent re-release also managed to place in the top 10, with the 75th anniversary edition of The Wizard of Oz ranking as high as 5th. This is not the second time that Warner Bros. as released an "anniversary" edition of the film on Blu-ray, the previous one being five years ago for the 70th anniversary. And for the final new release in the top 10, The Frozen Ground debuts at 8th place. A couple of new releases did not make the Blu-ray top 10. Fright Night 2: New Blood finished in 13th, while How I Met Your Mother: The Complete Season 8 was a DVD only release. These new releases, especially The Little Mermaid and The Croods, plus Iron Man 3 from last week, all contributed to the good results for the week, with 3 of the last 4 weeks having a Blu-ray revenue figures of above $40m! Of the new releases, This Is the End actually had the best BD sales share, with 48.14% of all sold units having had the Blu-ray version of the film included. The Wizard of Oz was closely behind at 47.91%. The Croods managed 40.78%, which is very good for a kids animated title. Fright Night 2: New Blood's BD sales share was 28.57%, with The Frozen Ground managing 24.41%. Surprisingly, many of the new releases this week had Blu-ray 3D versions. The Wizard of Oz had the best BD3D sales share, with 23.07% of all sold units containing the 3D version of the film (unsurprising, since this new release's headlining new feature is the 3D presentation of the film). The Little Mermaid was also available in Blu-ray 3D, with a sales share of 8.91%. Only 6.61% of those that purchased The Croods opted for the edition that contained the 3D version of the film. The stats for the week ending 6th October 2012 are as follows. Some small adjustments to the data posted last year (based on more recent updates) has been made and is shown below. Another mostly "red" week, with only this week's Blu-ray market share, which just managed to top the same week last year's results, preventing an all red week from happening. With that in mind, Blu-ray sales decreased by $3.84m (down 7.6%), while DVD sales decreased by $14.51m (down 14.9%) producing an overall loss of $18.35 million in combined revenue. Blu-ray's market share grew from 34.15% to 36.02%. The release of The Hangover Part III could not help Blu-ray revenue and market share from slipping from last week's highs. It wasn't even enough to actually grab top spot on the Blu-ray sales chart for the week ending 12th October 2013 - last week's number one, The Little Mermaid, held on to top spot. A little bit further back in third place was After Earth, also new for the week. Other new releases include The Purge in 6th place, Curse of Chucky in 11th, American Horror Story: Asylum in 12th, Monster High: 13 Wishes in (coincidentally) 13th, Europa Report in 17th and the Walmart exclusive Alpha and Omega 2: A Howl-iday Adventure in 18th. There was also Bones: The Complete Eighth Season that was new, but it was a DVD only release. But despite the number of releases, as stated earlier, both Blu-ray revenue and market share fell (DVD revenue also fell, but at a slower rate). Of the three new releases in the Blu-ray sales top 10, After Earth actually had the best BD sales share, with 46.30% of all sold units having contained the Blu-ray version. The Hangover Part III was further behind at 44.10%, with The Purge managing 41.85%. Of the releases that failed to make the top 10, Europa Report did really well with 44.74%, Curse of Chucky at 30.28%, American Horror Story: Asylum at 27%, Alpha and Omega 2: A Howl-iday Adventure at 23% and Monster High: 13 Wishes at 12%. None of the new releases were available on 3D. The stats for the week ending 13th October 2012 are as follows. Some small adjustments to the data posted last year (based on more recent updates) has been made and is shown below. An all red week again, but with justification. This time last year, Prometheus debuted on Blu-ray, and E.T. was also released on the HD format for the first time. With that in mind, the differences between this year and last year wasn't as great as you might expect. Blu-ray sales decreased by $7.75m (down 16.9%), while DVD sales decreased by $10.39m (down 11.3%) producing an overall loss of $18.14 million in combined revenue. Blu-ray's market share dropped from 33.27% to 31.84%. Pacific Rim and The Heat battled it out for this week's number one spot - with both winning eventually! The Heat was comfortably the best selling disc for the week, but Pacific Rim was also comfortably the best selling Blu-ray title, thus indicating the two titles' vastly different BD sales share stats. These two helped both Blu-ray and DVD revenue to rise, although Blu-ray did better than hence, Blu-ray market share was up compared to last week as well. Apart from these two, the only other new release that managed to get into the Blu-ray top 10 was Kevin Hart: Let Me Explain, in 10th place. You have to go down to 14th on the Blu-ray chart to find the next new release, which was Vikings: The Complete First Season. Star Wars: The Clone Wars — Season Five was also new, at 16th. The Colony, in 17th, rounded off the new releases in the top 20. The Walmart and DVD exclusive Dracula: The Dark Prince made the combined Blu-ray and DVD top 20, at 20th. But this week was all about the top two titles, helping weekly Blu-ray revenue to rise above $40m for the third time in the last 6 weeks. Going in order from the new releases with the best BD sales share, to the lowest, we start with Pacific Rim's 60.35% (meaning 60.35% of all disc packages sold contained the Blu-ray version of the film); Vikings: The Complete First Season managed 40.47%, Star Wars: The Clone Wars — Season Five got 39.15%; The Heat "only" had 33%, which explains why it and Pacific Rim reversed positions on the combined and Blu-ray only charts; The Colony had 21%; and Kevin Hart: Let Me Explain managed 18%. Of the new releases, only Pacific Rim was available on Blu-ray 3D, with 12.83% of all sold disc packages having contained the Blu-ray 3D edition of the film. The stats for the week ending 20th October 2012 are as follows. Some small adjustments to the data posted last year (based on more recent updates) has been made and is shown below. Blu-ray sales increased by $3.1m (up 7.7%), while DVD sales decreased by $10.85m (down 11%) producing an overall loss of $7.75 million in combined revenue. Blu-ray's market share grew from 28.96% to 33.04%. 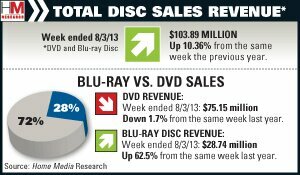 Both Blu-ray and DVD revenue fell back compared to recent highs, due to a relatively slow week in terms of new releases. The Conjuring was the best selling Blu-ray title of the week. Google infomercial The Internship was the next best new release, but only coming in at 5th. And that was it, in terms of new releases in the top 10. Outside of the top 10, we have The Way Way Back in 13th, Dead in TombstoneAmazon.com: Dead in Tombstone (Blu-ray + DVD + Digital Copy + UltraViolet): Danny Trejo, Mickey Rourke, Anthony Michael Hall, Dina Meyer, Richard Dillane, Colin Mace, Emil Hostina, Ovidiu Niculescu, Ronan Summers, Edward Akrout, Radu Micu, James Carr in 16th, Barbie & Her Sisters in A Pony Tale in 17th and Only God Forgives in 19th. Not the most stellar line up, hence the dip in results. Other than the Blu-ray exclusive The Conjuring, which automatically gets a 100% BD sales share, the next best performing title on Blu-ray when compared to DVD sales was Only God Forgives, at 38.70%. 35.83% of all discs sold for The Internship contained the Blu-ray edition of the film. Despite being the top seller, The Conjuring only had a 33.28% BD sales share, just ahead of The Way Way Back at 33.02%. As for the rest, Dead in Tombstone managed 29.61%, while Barbie & Her Sisters in A Pony Tale only got 8%. None of these new releases were available on Blu-ray 3D. The stats for the week ending 27th October 2012 are as follows. Some small adjustments to the data posted last year (based on more recent updates) has been made and is shown below. Blu-ray sales decreased by $9.75m (down 24.6%), while DVD sales decreased by $30.86m (down 28.3%) producing an overall loss of $40.61 million in combined revenue. Blu-ray's market share grew from 26.65% to 27.64%. Both Blu-ray and DVD revenue rose compared to last week, but the rise in Blu-ray revenue was far more significant. It was all thanks to this week's A-list release of Monster University. This blockbuster, which managed to earn more than $260m at the US box office, easily outsold the second placed (and also a new release) R.I.P.D.. By more than than a 6 to 1 margin. Other than these two new releases, it was a pretty quiet week. Bounty Killer was the only other new release in the top 20, coming in at 16th on the Blu-ray top 20 chart. But it's not quantity, it's quality, and Monsters University definitely had that. Of the new releases, Monsters University had the best BD sales share of 48.55%, meaning 48.55% of all disc packages sold contained the Blu-ray version of the film. R.I.P.D. wasn't too far behind though, at 44.19%. Both were available on Blu-ray 3D as well, again Monsters University was on top with 5.54% of all disc packages sold containing the 3D version of the film, compared to R.I.P.D. 's 3.66%. Bounty Killer managed to get a BD sales share of 27.40%. The stats for the week ending 3rd November 2012 are as follows. Some small adjustments to the data posted last year (based on more recent updates) has been made and is shown below. Blu-ray sales increased by $11.51m (up 38.1%), while DVD sales decreased by $9.05m (down 9.4%) producing an overall gain of $2.46 million in combined revenue. Blu-ray's market share grew from 23.89% to 32.36%.